The resume has changed and you need to know how...and what to do about it to bring yours into the digital age! Way back when, you could put down your few bits of experience, education and personal interests on a piece of paper and probably land a job. Today, most resumes are scanned by automatic tracking systems, looking for specific keywords appropriate to the position being offered. If they don't spot those words in your resume, you're out. You'll never get the interview. 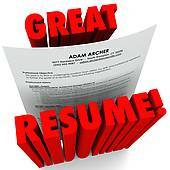 With that in mind, I offer the latest and in my opinion, the best materials, on and offline, to help you create the best resume (and other important materials like your LinkedIn profile) you can, not only to look good, but to please those tracking systems. The first book on the list is a bit quirky, but I highly recommend it. It's up to date, a different approach, and a kind of in-your-face approach to resumes and other online job search materials. "The Internet really has changed the landscape of recruiting and job seeking..." Indeed. You may never have to use a hard copy resume again after you read this. From the back cover: "A great resume? More likely to hurt your job search than help it." Tantalizing, eh? If you want to be led by the hand through the resume process, this might be for you. CAUTION: These are just a few of the hundreds of sites on creating your resume. Don't be fooled into spending a large amount of money to get your resume done by an 'expert.' You can do it yourself for practically no money. And today, along with your LinkedInProfile*, you can create an online resume that can easily be printed out if you need it on paper. This is noteworthy. I have been perusing practically every one of the scenes of your article and this shows how dedicated you are. Caps off continue developing and get info to click on https://www.analyzedu.com/writing-services-reviews/trustmypaper-com-review.html to get educational task. Good luck with that and this isn't anything but difficult to expound on each and every day.